At the isolated Woodstock Farm in rural England, workaholic composer David Winter is depressed because he feels that his wife, actress Mary, is unfaithful. In a dark and stormy night, Lucinda Jessup, the ghost of a witch from the 17th Century and former dweller of the farm, arrives in the barn and possesses David. Mary fights against Lucinda trying to recover David. Ruth, the reporter for the women's section of a magazine, is assigned by her editor to participate in the ten-weeks course of a new weight-loss organization called "Think Thin". According to a letter from a reader, the course is very masochistic and depressing, destroying the self-esteem of the patient. Ruth makes a friend in the course, who dies in a car crash. During the funeral, an employee of the funeral house discloses weird events that are happening in his job. In her investigation, Ruth finds dark and macabre secrets. The real state agent Norman Shenley hates his old wife Emily Shenley and wants to divorce her to marry his secretary Lolly. When a new client wants to sell an old and isolated mansion, Norman begins to have odd nightmares, and he becomes confused between reality and dream. When Norman awakes, a surprise waits for him. After the death of their son William Morton, the diplomat Laurie Morton and her husband, the scientist Terence Morton adopt a boy, James. From the moment James moves to Morton's house in the country on, weird things happen with the family. William and Emma Peters buy an old house where a brutal murder happened years ago in very bad condition with the intention of restoring it. They move with their daughter Sophie, and become friends of their neighbors Jean and George Evans. However, eerie events happen in the house, inclusive the death of Sophie's cat. In Sophie's birthday party, a pipe leaks blood and they leave the place, disclosing a secret later. After the death of his uncle, Graham inherits his Arts collection and his beloved wife Sarah decides to keep a weird fetish and gives the name of Charlie Boy. A friend of them explains that it was a voodoo toy. When the other inheritor, Peter, calls of the idea of raising a movie production company, Graham uses a picture with five persons, including Sarah and himself, to wish Peter died. When the persons in the picture die, Graham tries to find a way to save Sarah and him. When Chuck Spillers is released from prison, he tells his wife Annie that he had been visited by an old man, Martin Blueck, along his sentence for robbing a safe, and Blueck had given some money for him to help a fresh start in life. On the next morning, Chuck pays a visit to Blueck in his pet shop to thank the support and is invited to work for him feeding his animals in his private zoo while he is traveling. Blueck explains that he trains animals, conditioning then to obey some signals. A couple of days later, Chuck sees a safe in the store, and decide to open it, being trapped in a weird situation and disclosing the truth about the sadistic Blueck. Mrs. Ardoy is the caretaker of a creepy old house set in the heart of the forest, who takes in a stranded young couple with car trouble. Once tucked in for the night, the pair begin to experience mutual dreams about a pack of werewolves roaming the region by night. The dreams, of course, are not entirely what they seem... and for that matter, neither is their hostess. A serial killer rips out the heart of his victims, and Detective Inspector Clifford (Anthony Valentine) is in charge of the investigation without any lead. While listening to the radio, he becomes aware of a best-seller, in which the killer also removes the heart of his victims, and Clifford meets the writer, Natalie (Suzanne Danielle), and she tells that the character was based on a countess that lived centuries ago. Clifford asks for an appointment with the descendant, Mrs. Henska (Siân Phillips), who becomes his suspect number one. Although under investigation, the murders do not stop and Clifford tries to find other clue. Michael Roberts joins his friend Laura Stephens at an auction and talks her out of selling her newly-acquired mirror to a mysterious man who seems excessively eager to have it. When Michael takes it from her to have it appraised, its occult powers put him in the path of Allison, who has just run away from a secret society that wants to sacrifice her in order to conjure up a powerful devil. The head of this society is Charles Randolph, an evil hypnotist whom Michael will find extremely dangerous. In this Hammer Horror take of 'Diabolique', Penny is the mentally unbalanced wife of Harry Wells a crooked businessman who kills an intruder whom was a business rival of Harry's. After helping her husband hide the body to avoid a police investigation, Penny starts having visions of the dead man appearing before her which drives her more insane. Harry think's Penny's just imagining things, while a local psychic, named Margaret, suggests an exorcism to drive the ghost away. But the real surprise is yet to come. A hitch-hiker dressed in yellow oil skins attacks the driver of a car who has stopped to give him a lift. The car crashes and the driver fights with the insane hitch-hiker. It appears like the driver, though badly injured, has prevailed and is taken to hospital. The drivers wife subsequently learns that her husband has damaged his throat in the struggle and is unable to talk, she is also asked to identify the body of the madman. The body looks exactly like her husband and doubts begin to enter her mind as to which of the two is the killer. The only differences appear to be that the killer has rotten teeth and a claw-like finger nail. Who survived the fight her husband or the madman? 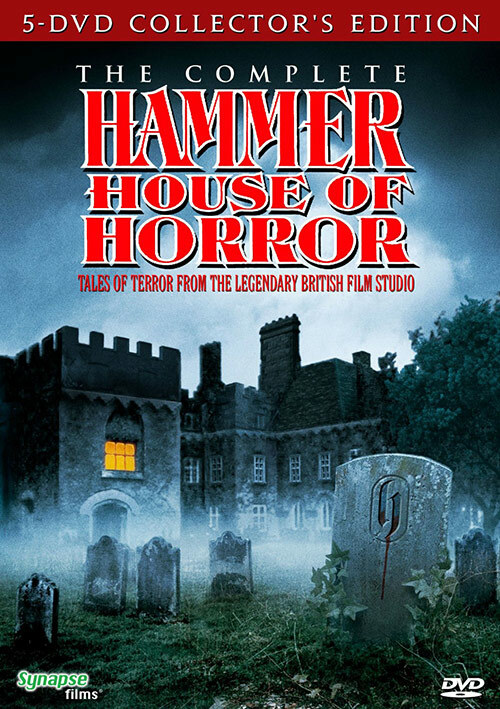 2 Response to "Hammer House of Horror (1980) "